Executive Room with king bed on the main or top floor of the Big River Lodge building. Wood burning fireplace, views of the gardens and Mendocino Bay. Most have a sofa bed for an extra guest. Paneled in ponderosa pine with redwood accents. Private Deck. Amenities include hospitality center with refrigerator, microwave, and coffee maker supplied with Big River organic, Fair Trade coffee. HDTV by DirecTV and complimentary WiFi. One bedroom suite with a king bed in the bedroom which has a small sitting area and a flat screen TV and DVD player. The living room has a wood-burning Irish Waterford stove which allows you to see the fire with the screen in place. The sofa folds out into a bed, which is already made, if needed. On the top floor of the Big River Building, this suite overlooks the Inn’s extensive gardens and out to Mendocino Bay and the village. Paneled in ponderosa pine with redwood accents. Private Deck. Amenities include a in-room “hospitality center” with refrigerator, microwave, and coffee maker supplied with Big River organic, fair trade coffees, HDTV by DirecTV and complimentary WiFi. Accommodations with a king size bed and daybed. The daybed provides twin bed comfort for up to two additional persons with a pop-up twins under each day bed. Each room offers a wood burning fireplace or Irish Waterford stove, views of our gardens and the ocean beyond, flat Screen HDTVs, compact stereo systems, refrigerators, coffee makers supplied with organic, fair trade coffee and private decks – overlooking Mendocino and the Pacific Ocean. Executive suite with king bed on the Garden Level, Main Level, and Top Level of the Forest Building. Each of these king rooms has a day bed for an additional guest. The room features a wet bar with microwave, coffee maker supplied with Fair Trade Organic Coffee, and refrigerator. 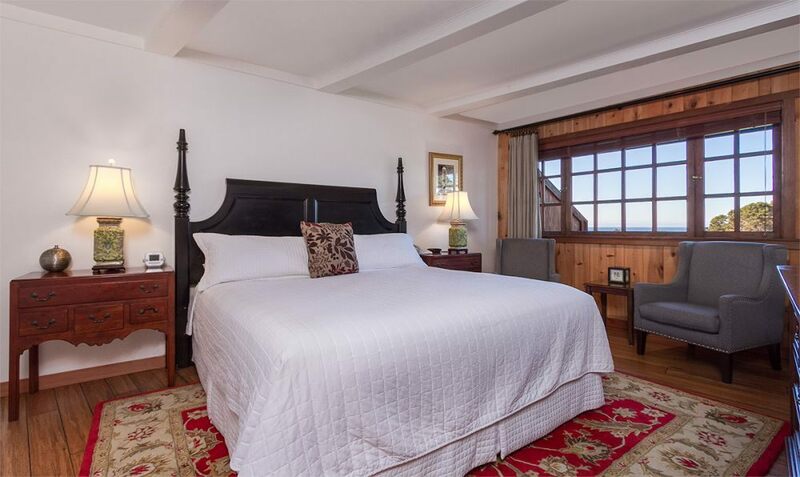 This room has a wood burning fireplace, and overlooks the Inn’s extensive gardens with a with a view of Mendocino Bay. Paneled in Ponderosa pine with redwood accents. Private Deck. Amenities include HDTV with DirecTV and complimentary WiFi.